I thought I’d talk a bit more on why I’m so excited for Epic 40k and why it’s so linked to my moniker today. 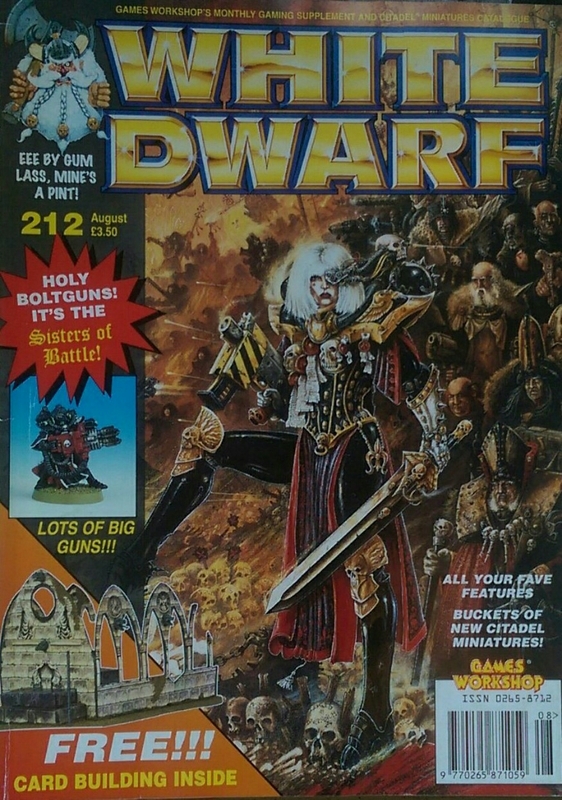 It all started with this issue of White Dwarf. Anyway, this was quite early in my hobby career and beyond the excellent Adeptas Sororitas coverage and that fantastic page that John Blanche had with conversion ideas for ecclesiarchy miniatures it had the forefathers of orks. We’re talking Gork and Mork incarnate here! Well if you’re worth your salt in the ways of the Waaagh (which is forward BTW) you know I’m talking about Adrian Wood aka Waaagh Ghrisnak..
Those guys are pretty epic in their own right! But back to the original question – why Epic? 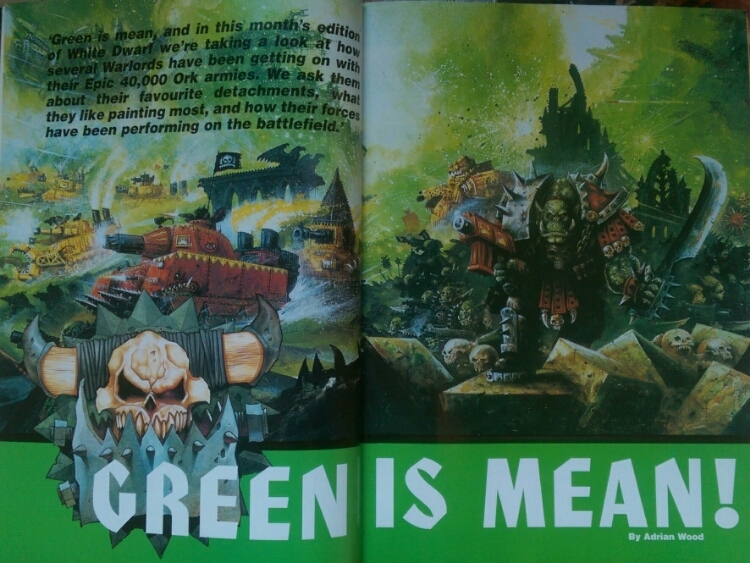 That’s one of the classic ork images which really shows them in all of their glory. Colourful, diverse, brutal and endless. The sum of what a Waaagh truly is all about if you ask me. But why Epic right. Well it’s only Epic that truly can replicate that in miniature form. 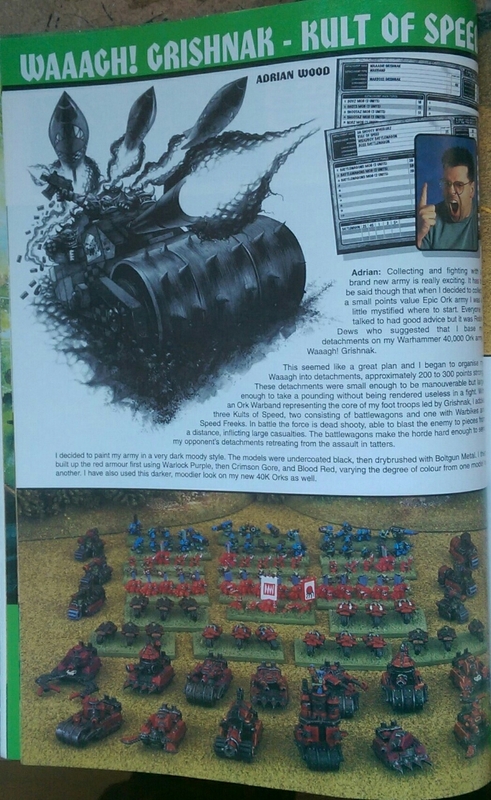 I mean look at the pictures of Andy Chambers’ orks. 40k or fantasy can’t even get close if you ask me, not even these days. Let’s start to shift over to the moniker and why I hold those two guys so high. Well last thing first – they just had loads of fun. It just oozed out of those pages and I spent countless hours looking at these and other pics in my White Dwarf collection, reading and rereading the articles in my early teens. And those two guys in every outing but especially those with anything green stands out. Oh and to digress a bit, I can’t forget about Paul Sawyer aka (sir) Fat Bloke. The man that was editor of White Dwarf in the Golden Age of GW. Man those where the days! Okay so this just turned out as an unstructured mess..
Well those things made Bigbossredskullz. Yeah I dabble in other systems and I do more than greenskins but when you get down to it I hold nothing dearer in my collection than my orks and that’s why I still maintain the moniker despite “maturing” as a hobbyist. I’m still just a fun loving, dakka blasting and choppa wielding ork at heart! So if I can continue in the vein of Adrian Wood and Andy Chambers maybe even influence someone down the line like I was inspired..well that would be pretty freaking awesome. Orks were always my main love in the Warhammer 40,000 universe. I loved all of those Adrian Wood articles. I remember he had a bunch of Dreadnaught conversions using parts of a Fantasy catapult. I always wanted to replicate them, but at that time, I was a teenager and had no money. I also remember a battle report from that time were they emulated the film Zulu, with Orks being the Zulu warriors. Then we share the same fond memories mate 🙂 the last there was Wood vs Fat Bloke actually. Must be one of the most iconic batreps in WD history. I loved that so much. It really had an excellent narrative. 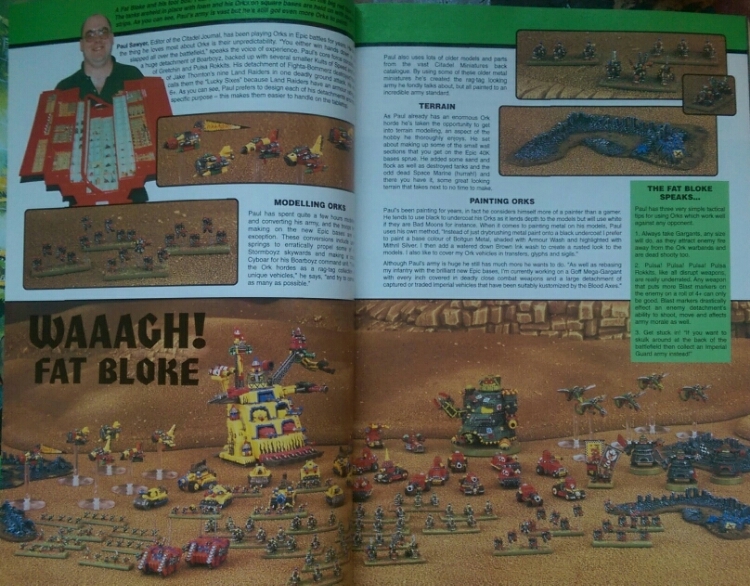 I need to dig through my old White Dwarf magazines and find it. I am sure that it will be equally inspiring today, now that I am older and actively trying to forge my own narratives for my projects. This has particularly been the case with Pilgrym stuff my brothers and I have been doing. Eric and I have been writing most of the background for the models Adam has been building. My brothers and I started playing 40k during the 2nd edition, and Epic was slowly on its way out. We never had the funds to play it, but it would be fun to revisit it now. It was a pleasure to read this post. Definitely and they just had so much fun doing it. I still feel to this day that the Fat Bloke era of WD I’d my most important source of inspiration. Wow do all those pictures bring back memories! I loved that issue; it was published not long after we started playing! That little paper shrine was great, I think we might still have it somewhere, ha ha. Same here 🙂 My first WD is 206 so I probably started a year prior to issue 212 as my local hobby store didn’t start with WD right off the bat.